A wide and even space with smooth surfaces, free from protrusions. 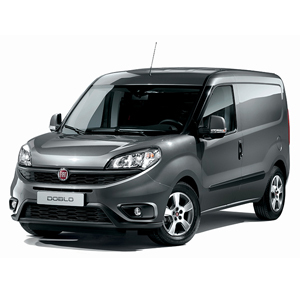 Up to 2170 mm in length, extendable up to 3400 mm thanks to the swivel partition and the folding passenger seat. Up to 1550 mmhigh and 1714 mmwide. Load capacity from 3.4 to 5 m³, can be increased by 0.4 m³ thanks to the swivel partition. Width between wheel arches1230 mm. Panelled floor with 6 load retaining hooks and inspection plug. Washable, waterproof PVC load platform. 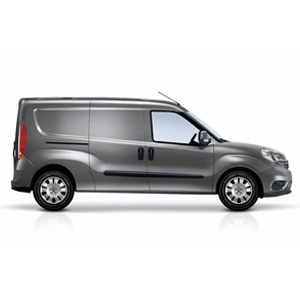 9 types of partition (panelled, panelled and soundproofed, glazed, glazed and soundproofed, ladder, grill and two-part grill, of which one part swivels, multifunctional tubular for 3-seater cab versions). 2 service lights, one above the sliding door and the other above the rear door. Load compartment lengthfrom 1820 mm to 3050 mm – with front passenger seat folded down. Load compartment widthfrom 1518 mm to 1714 mm. Volume from 4 to 3.8 m³ -with front passenger seat folded down. Payload from 750 to 1005 kg. With special tyres, reinforced suspension and an upgraded brake system. 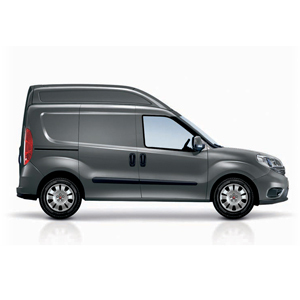 Load compartment lengthfrom 2170 mm to 3400 mm – with front passenger seat folded down. Volume from 2 to 4.6 m³ with front passenger seat folded down. Height 1550 mm. 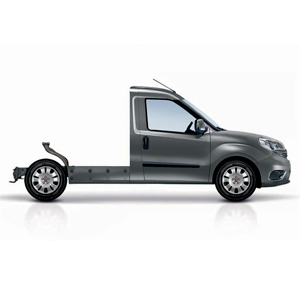 Load compartment lengthfrom 1820 mm to 3050 mm – with front passenger seat folded down. Volume from 4 to 4 m³ with front passenger seat folded down. Height of load compartment 1550 mm. 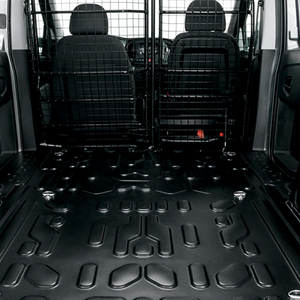 Load compartment length from 2170 to 3400 mm – with front passenger seat folded down. Volume from0 to 5.4 m³ – with front passenger seat folded down. 3 m long, 1.82 m wide and 4 square metres of surface area for transporting up to 3 Euro pallets or 33 crates of fruit. Body with marine plywood platform and shaped folding aluminium sideboards. Pole/ladder rack with load securing hooks to hold up to 300 kg. External storage compartment with lock,located under the load compartment, for stowing tools up to 2 metres long. Side access step to facilitate access into the body. Folding steps located inside the sideboard. 2 versions available: short wheelbase (2755 mm) and long wheelbase (3105 mm). Record maximum permitted axle load from 1200 kg* (front) to 1450 kg (rear). Maximum body length of 2285 mm (2795 mm for the long wheelbase version), maximum body width of 1870 mm. Platform length 1765 mm (2115 for the long wheelbase version). GVW from 2210 to 2505 kg. All types of vehicle body can be easily adapted to fit the body shell; a specific interface for electrical systems may also be requested.